In mid-August this year, the Port of Sept-I^les, in partnership with Destination Sept-I^les Nakauinanu, officially opened the Hermel exhibition site in the Port of Sept-I^les Marina building. As part of the strategy promoting Sept- I^les as an international cruise destination, the Port and Destination Sept-I^les Nakauinanu wanted to make the Hermel accessible to cruise passengers as well as tourists and locals. To do so, they renovated the Marina building to refurbish existing facilities and create a space dedicated to this remarkable transatlantic watercraft. An interactive console sits next to the Hermel, allowing visitors to learn about the famous rowboat and its 129-day voyage across the Atlantic. In addition to being the new home port for Myle`ne Paquette’s legendary boat, the Marina building now houses a Tourisme Sept-I^les kiosk and an interpretive display about the Bay of Sept-I^les itself. Until Labour Day,Tourisme Sept-I^les staff will be on-site to bring the exhibits to life and answer visitor questions. “Thanks to our generous partners, the Hermel exhibition is now a part of the Port of Sept-I^les. We’re grateful to Destination Sept- I^les Nakauinanu, and to Tourisme Sept-I^les and the Club nautique de Sept-I^les, who helped make it possible to bring the Hermel to her new home port in our marina,” said Pierre D. Gagnon, the port’s president & CEO. “The Hermel is a symbol of the maritime community. She travelled the same route as most ore tankers that pass through our port and her courageous captain is a force of nature. 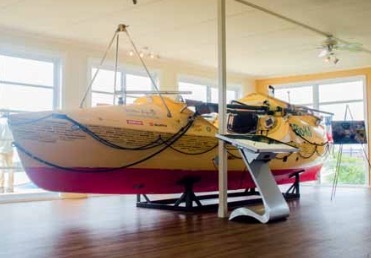 This little yellow boat will be a major attraction for locals, school groups, visitors, tourists and cruise passengers,” added Manon Langlois, chair of the Destination Sept-I^les Nakauinanu board. In April 2014 the Port of Sept-I^les won the bid to acquire this symbol of courage, determination, and achievement that embodies the Port’s values and will now be displayed there permanently. Boasting diverse, state-of-the-art facilities, the Port of Sept-I^les is one of the largest ore-handling ports in North America. The port’s infrastructure plays a vital and strategic role in the economy of Eastern Canada, with annual economic impact estimated at nearly $1 billion and nearly 4,000 direct and indirect jobs.